The Planet Of The Apes of our childhood was one of the most unambiguous films ever, based on the esoteric idea of "What if monkey people could talk and took over the world?". It was cheesy and bombastic fun that worked because, who could resist picking up such a ludicrously titled film? And then came Conquest Of The Planet Of The Apes. 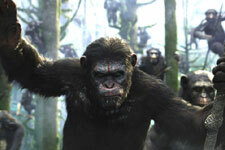 And then came Battle For The Planet Of The Apes. These went bad quickly, simply because we don't want to see monkey people take over the world. We want to see them as already having taken over, and for "real" people to "win". Therefore, this new attempt at making a gritty reboot of what was intended to be a film version of something that could find place in Harvard Lampoon is as puzzling as it is seemingly meaningless. What it isn't, surprisingly enough, is anywhere near as laughably bad as you would expect it to be, instead choosing to be laughably good. In the prequel to this movie, Rise Of The Planet Of The Apes, you see actual attempts at the sort of back-story building that sci-fi fans can really sink their teeth into. Dawn Of The Planet Of The Apes takes it one step further by giving you strong characters you will actually like, albeit the characters you really like tend to look more like our supposed ancestors than us. So, by the end of the prequel, humanity has been more-or-less eradicated by something that we cannot believe has not been stopped in real life - genetic modification in viruses to treat disease. Caeser (Andy Serkis), the monkey who started the whole shebang, is finding his bearings as the leader of a new tribe of genetically modified apes, and believes all humans dead as he has not encountered any in 10 years. When a group of surviving people, headed by Malcolm (Jason Clarke), looking for sources of electricity stumbles across Caeser and his tribe, Caeser has a short while to be reminded of all that is good and utterly awful about us before trouble starts brewing. You see, Malcolm's project to renew a dam is needed to supply power to San Francisco where a whole bunch of people have survived the ALZ-113 virus pandemic, with Dreyfus (Gary Oldman) as their leader. Dreyfus' trigger finger is set on hair trigger, and he believes that these apes, who benefitted from the spread of the virus, are at fault for the death of his family. On the monkey side, you have Koba (Toby Kebbell), Caeser's right-hand bonobo, who distrusts people because they caged him to conduct cruel experiments on him. While Koba plays Brutus to Caeser's, well, Caeser, Dreyfus has no trouble whipping the people of San Francisco into a foaming fury against the apes. It is now upto Caeser and Malcolm to tell everybody to just cool it on the killing, guys! The best part of the film is Caeser. If you've seen the previous part, you will probably be even more invested in the character. In fact, all of the simian characters are more... human than the human characters, who have a tendency to stick to a type of a type per character. Malcolm is the peace guy while Dreyfus is the war guy, Ellie (Keri Russell) is an Earth Mother type, and so on and so forth. The performances are just fine in general, but it is the screenplay and the pacing that make the whole work. The graphics were pretty astounding the last time around, and are taken up a notch this time to give us even more lifelike ape characters. The film is a tad too gloomy and preachy, and the first half could have done well with more time in the cutting chamber. But there is just enough subservient ridiculousness to tide you over to when it gets seriously fun. Summer is officially at an end, but you will get to hold on to your vacation a little longer for the two and a half hours you're watching this one. 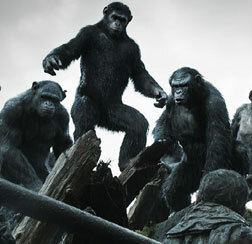 Be the first to comment on Dawn Of The Planet Of The Apes! Just use the simple form below. fullhyd.com has 700,000+ monthly visits. Tell Hyderabad what you feel about Dawn Of The Planet Of The Apes!